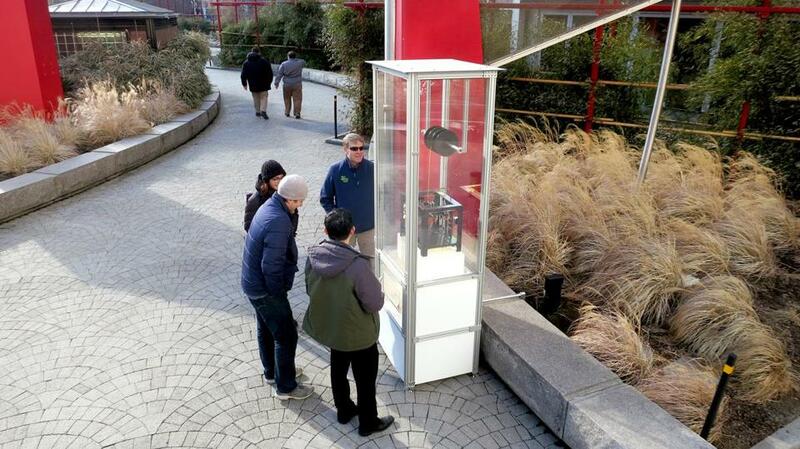 The 3-D printer in “Make and Take,” housed in an 8-foot-tall polycarbonate kiosk, is expected to create more than 2,000 palm-size rooster figures throughout the installation’s time in the Greenway’s Chinatown Park. 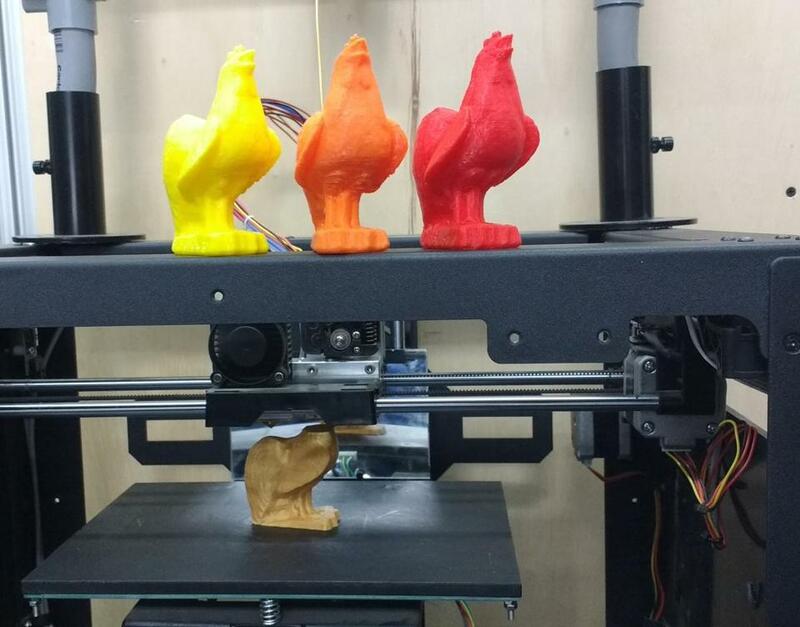 “Make and Take,” a temporary installation on the Rose Kennedy Greenway, 3-D prints roosters in honor of the Chinese zodiac year. The 3-D printer, housed in an 8-foot-tall polycarbonate kiosk, is expected to create more than 2,000 palm-size figures throughout its time in the Greenway’s Chinatown Park, which began with the Chinese New Year, on Jan. 28, and will end mid-February 2018. With the volume of roosters in mind, artist Chris Templeman knew he’d have to make quite large the clear receptacle into which the figures drop after the printing process. Surely, he thought, the free roosters would pile up over time. Templeman’s piece, commissioned by the Greenway Conservancy and created in collaboration with New American Public Art, serves as the third annual installment in a Chinese zodiac-inspired series. 2015 brought Kyu Seok Oh’s handmade “Wandering Sheep” sculptures to the Greenway, and last year hosted Don Kennell’s fiery steel structure “Monkey See.” Though Templeman’s work still pays homage to the Year of the Rooster and the culture of those in Chinatown, it does so in a more contemporary manner. The printed roosters are based on a 3-D scan of a 19th-century Chinese artifact from the Museum of Fine Arts. The “Make and Take” installation on the Rose Kennedy Greenway. The stark contrast between the porcelain artifact, intended for the rich, and the 3-D-printed roosters, free to the public, could come across as commentary on the accessibility of art. Templeman said he is more concerned with democratizing the artistic process itself. An engineer by day, he used a consumer-grade printer in the installation and hopes to draw attention to the technology that has drastically altered his field. “Make and Take,” Templeman’s public art debut, is part of the Greenway Conservancy’s yearlong exhibition “Playful Perspectives.” Beginning with Mehdi Ghadyanloo’s “Spaces of Hope” mural, in Dewey Square, which was completed in November, the theme deals with both literal and figurative perspectives. “Chris’s [piece] is really interesting because we’re talking about a perspective of how art is being made, literally,” Cowan said. So far, Templeman said, the public has been more than willing to play the game.